Age-related macular degeneration (AMD) is the most common cause of vision loss in American adults over the age of 60. The presence of drusen within the macula is a common examination finding in patients with AMD. Here we further evaluate the histopathologic charactaristics of drusen in AMD. Eyes were obtained for research from an 88-year-old donor following appropriate informed consent. A fundus photgraph, gross photograph and histological sections of the same eye are here depicted. The left eye showed extensive choroidal neovascularization and disciform scarring and is described in a previous report. Note the presence of drusen in an annular pattern (arrowheads) and peripapillary atrophy (arrows) on both fundus and gross photographs (Figures 1A and 1B). 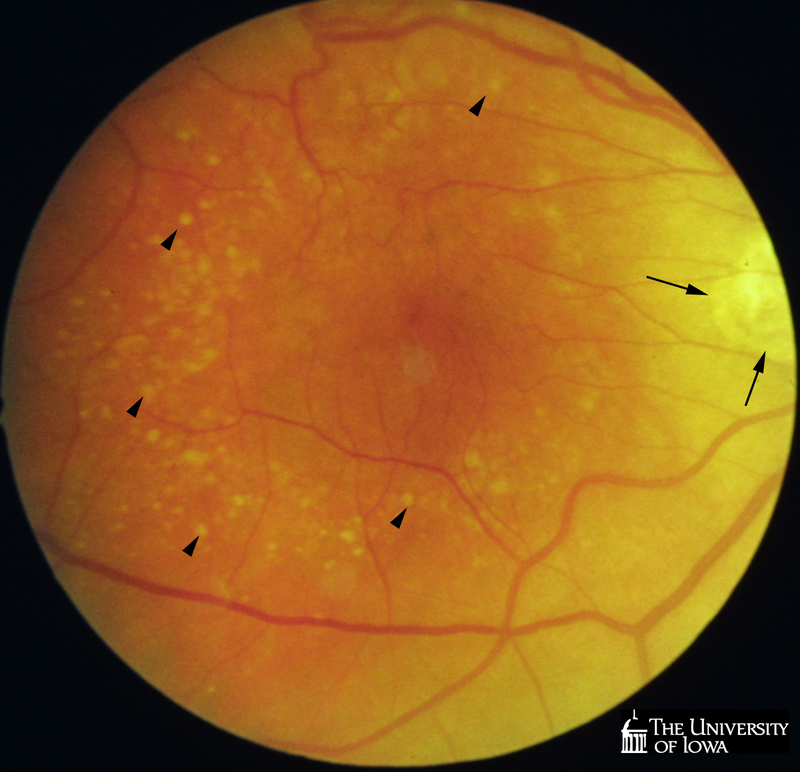 Figure 1A: Clinical image of fundus in the living patient before donation. 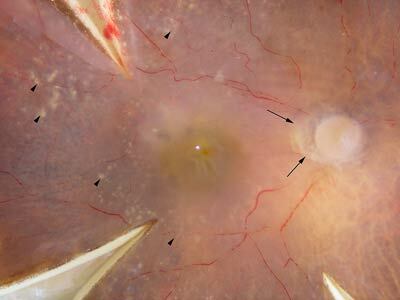 Figure 1B: Gross image of fundus in the donor eye. 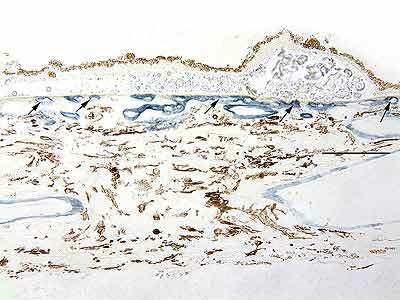 Histological section stained with hematoxylin and eosin shows a sub-RPE deposit from within the ring of drusen. In some cases drusen show substructural organization or layering; note the hematoxylin stained globular material within the deposit (see Figure 2). The attenuation of the retinal outer nuclear layer (ONL) as well as photoreceptor inner and outer segments, is not uncommon. 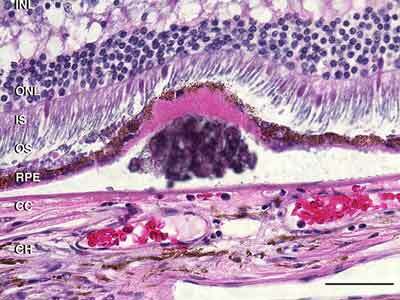 Corresponding changes in gene expression observed in retinal cells overlying drusen has been described. 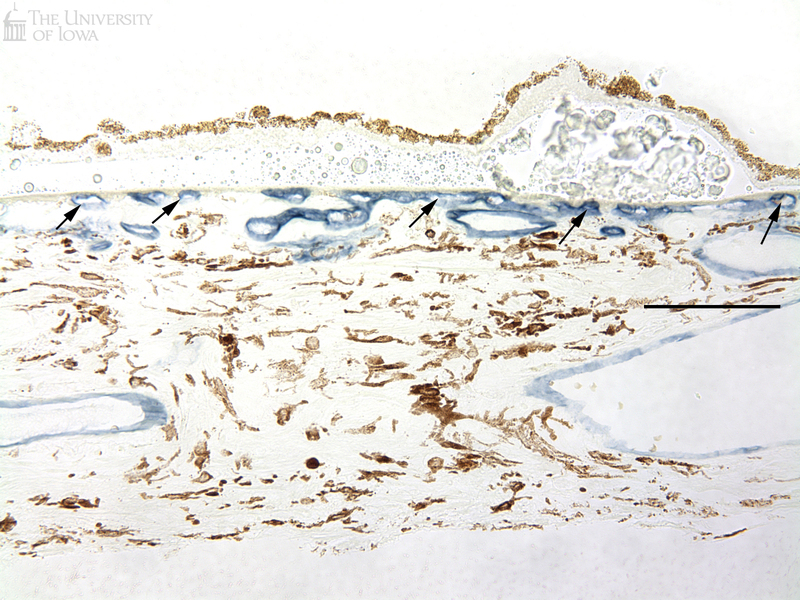 Figure 2: Drusen - H&E stain shows sub-RPE deposition. 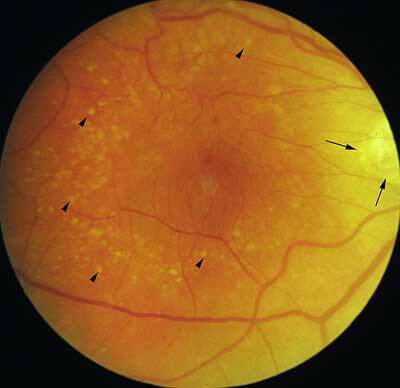 In addition to mounded, spherical or hemispherical deposits, diffuse extracellular deposits (basal laminar deposits or basal linear deposits) are also observed in macular degeneration, and were present in the macula of the same eye (white asterisks, Figure 3). When examined by fluorescence microscopy, lipofuscin in the RPE is highly autofluorescent when excited with both blue light (green emission) and green light (red emission). Areas of overlap in this merged image appear yellow. 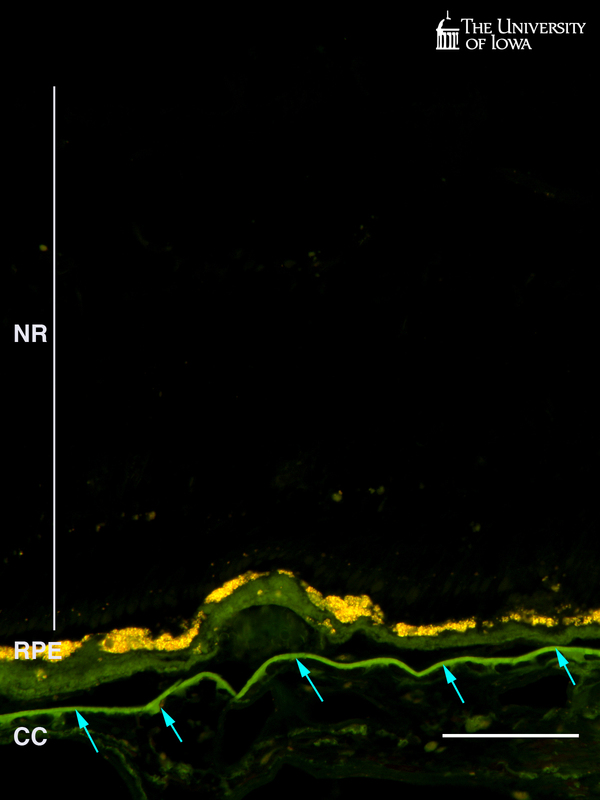 In contrast, subRPE deposits and Bruch’s membrane (arrows) show much greater emission over shorter wavelengths and thus appear predominantly green in this merged image (see Figure 4). Figure 4: Drusen - fluorescence of lipofuscin is readily evident. Figure 5 depicts staining of the vasculature (purple) beneath drusen (F) and in an area of scarring from the other eye (G). 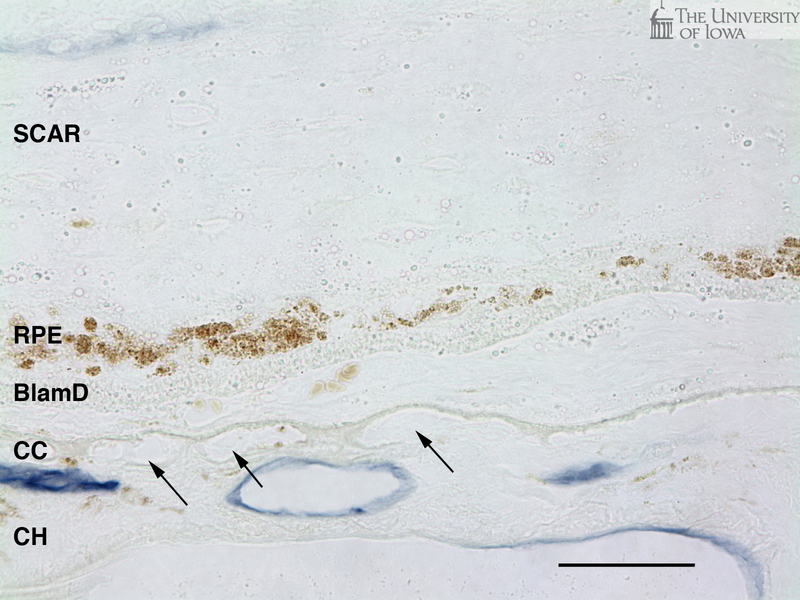 Viable endothelial cells stain purple with the alkaline phosphatase substrates nitroblue tetrazolium (NBT) and 5-bromo-4-chloro-3'-indolyphosphate p-toluidine (BCIP) under alkaline conditions. Interestingly, while the choriocapillaris persists at least to a certain degree beneath large and diffuse drusen/basal deposits, in areas of scarring from the other eye, only "ghost" vessels remain (i.e., areas resembling capillaries but without viable endothelium, arrows Figure 5B). Vessels in the deeper choroid are viable, however, since they are less reliant on the RPE for their differentiation and viability. Figure 5A: Drusen - vasculature beneath choroid. 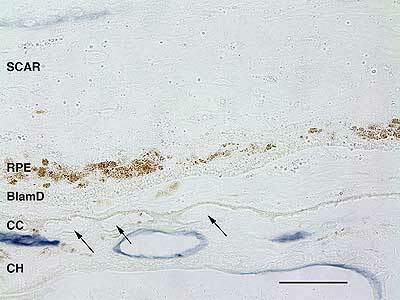 Figure 5B: Choriocapillaris "ghost vessels" in area of scarring. Note Scale: The scale bar is 100µm (Figures 1, 3, 4, and 5A) or 50 um (Figures 2 and 5B) in length. 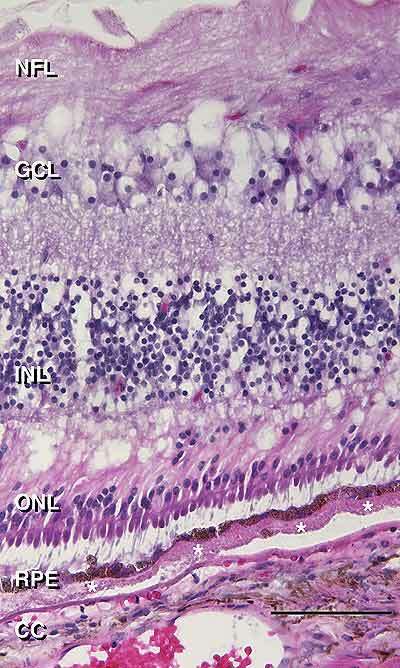 Abbreviations: NFL, nerve fiber layer; GCL, ganglion cell layer; INL, inner nuclear layer; ONL, outer nuclear layer; IS, inner segments; OS, outer segments; RPE, retinal pigment epithelium; CC, choriocapillaris; CH, deeper choroid (Haller’s and Sattler’s layers); NR, neural retina. Mullins RF, Grassi MA, Skeie JM. 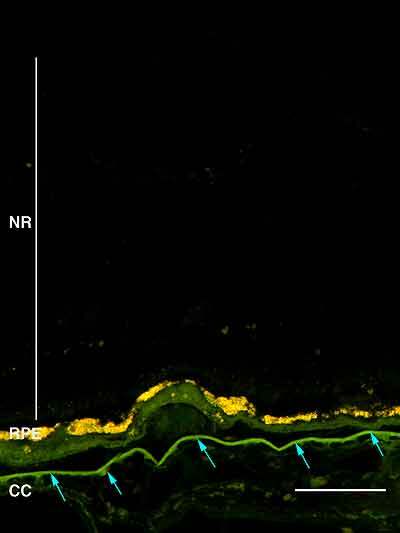 Glycoconjugates of choroidal neovascular membranes in age-related macular degeneration. Mol Vis. 2005;11:509-17. Johnson PT, Brown MN, Pulliam BC, Anderson DH, Johnson LV. Synaptic pathology, altered gener expression, and degeneration in photoreceptors impacted by drusen. Invest Ophthalmol Vis Sci. 2005;46(12):4788-95.